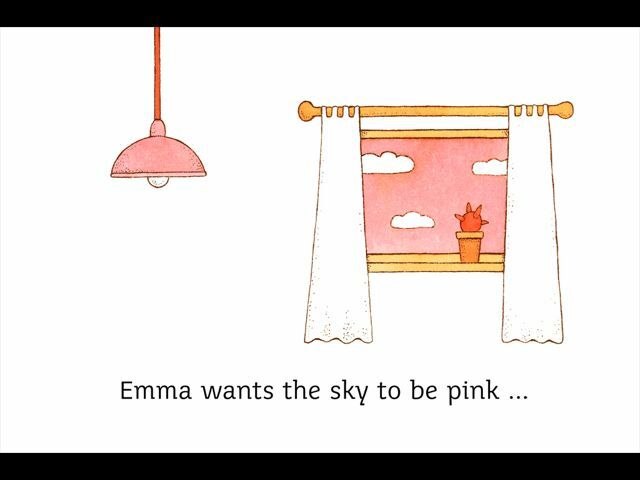 The art style in Emma Loves Pink is old fashioned and sparse, but very effective. The drawings are very simple, and the backgrounds typically consist of nothing more than a white page. Shading is usually accomplished with just a smattering of black dots. 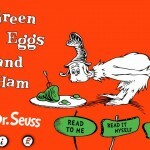 But all of this fits the simple story perfectly, and the style appeals to children—it’s like something they would draw. 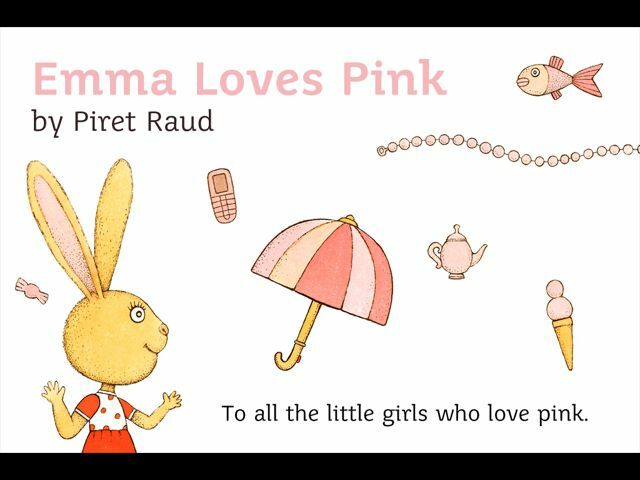 There is no music in Emma Loves Pink, nor any sound beyond the narration. This is the story of Emma, who loves the color pink. She has many pink things, which are variously described. But this is not enough for Emma. “Emma wants the sky to be pink . 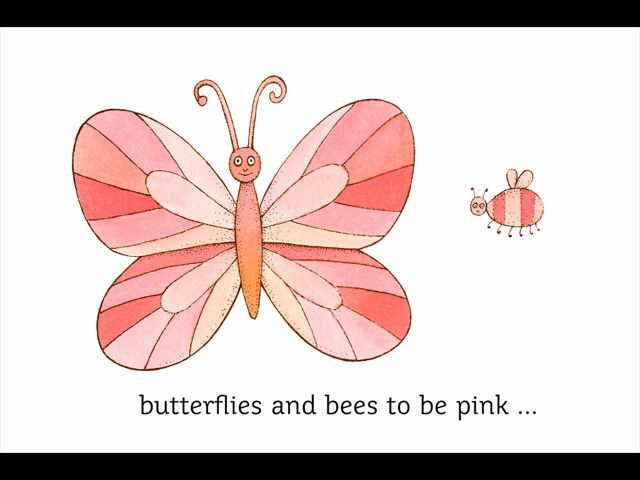 . . and the trees to be pink, butterflies and bees to be pink . . . and the rain to be pink. 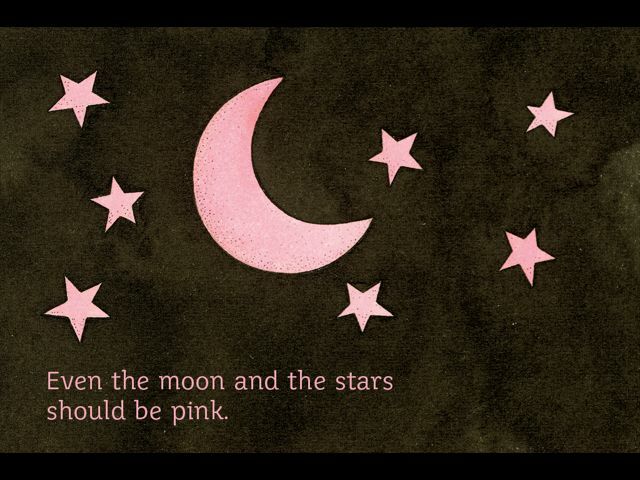 Even the moon and the stars should be pink . . . . Everything should be totally completely entirely pink.” But in time, Emma learns that perhaps other colors are just as good as pink after all. 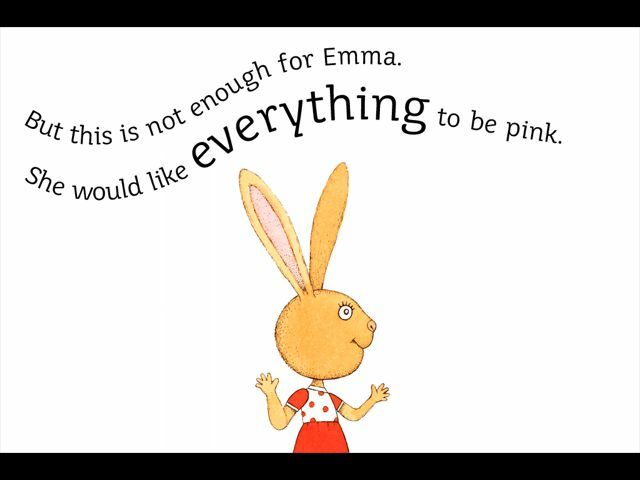 It’s a cute enough premise as is, but it’s so expertly and concisely written, not to mention narrated with such charm, that you cannot help falling in love with Emma and her obsession with pink. Plus, this story comes with a surprise twist at the end that will paint a huge smile on your face. 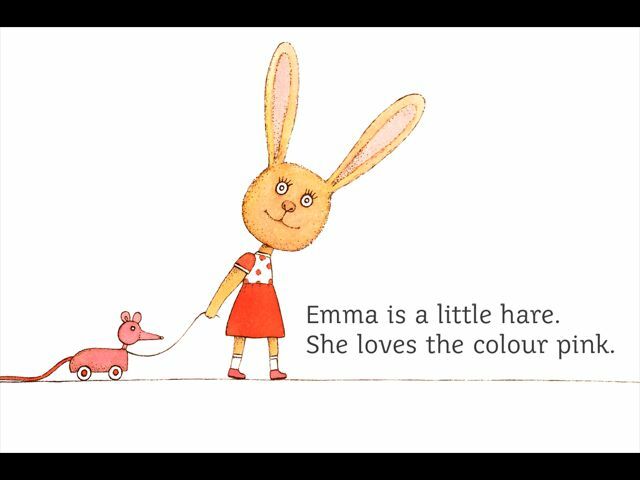 The narration in Emma Loves Pink is absolutely brilliant, which comes as a bit of a surprise since it’s narrated by a young child. Generally speaking, using children as narrators is a gimmick that grows old very quickly. They just don’t have the emotive skills, or reading ability, to effectively deliver a good narration. And what starts out sweet, quickly becomes trite and saccharine. 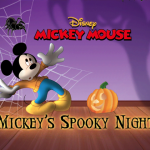 Here, however, the narrator is very young, speaks with a delightful accent from somewhere in the U.K., and even has a bit of trouble pronouncing certain sounds correctly. It should by all rights be exactly the sort of thing that wears thin quickly, but it’s spectacular. And adorable. I can’t imagine this story being delivered better. As good as the narration is, however, I wish I had the option to read it myself or, better, yet, to record myself and become the narrator. But the default narration is so good, that these are fairly minor complaints. Also, the book can be narrated in two languages in addition to English. One is Eesti and the other is an Asian language, but I can’t tell you which one because I cannot read the Asian script. There is no interactivity during the main story of this book. There is, however, a little game that can be selected from the title page that is nothing more than a blank white page on which your child can place “stickers” (which are just characters and images from the book). The stickers can be shrunk or enlarged, and rotated. There are only a ten stickers to choose from. Once your kid is finished placing stickers, the resulting masterpiece can be saved to your photo library. It’s pretty basic. My daughter likes to play with it whenever she reads the story, but I don’t think she would ever fire up the book just to get at the game. This is one of my daughter’s favorites. She chooses it at least once a week during story time and we’ve had it for the better part of a year, I think. When I first bought it for her she chose it every night for a good two or three weeks straight (she gets to choose three stories per night at bedtime). Your daughter will love this book. Your son, on the other hand . . . well, my three-year-old nephew likes it. But while I’m pretty sure my ten-year-old nephew likes it as well, he would never admit to it, and he would never choose it at bedtime. 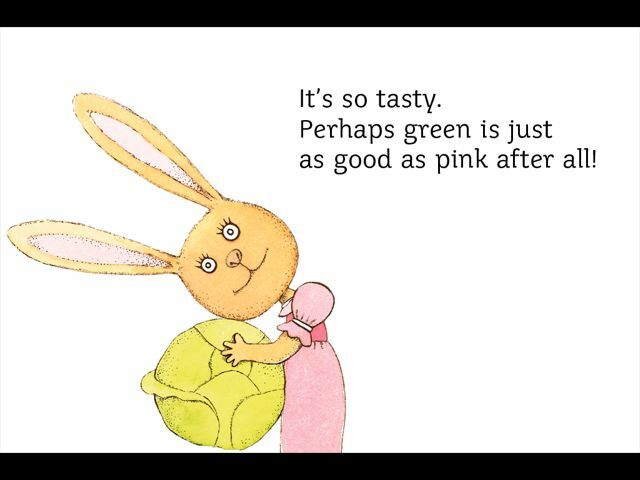 As I said, my daughter has been choosing this book for months. I’ve read it (or had it read to me, rather) probably at least fifty times. It never gets old. It helps that the book is short. 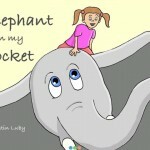 But more importantly, it’s well written, well narrated, and is spilling over with charm. Buy this book if you have a daughter. Think seriously about buying it even if you only have a son.